Well after a busy six weeks or so, studying flat out, I’ve completed and passed my course. So I figured I should catch up with my blogging a bit, and set my mind to things other than completing assignments and working. I know there were other things I used to do … I just have to remember what they were! I made these a while back, but looking at the photo’s I think another batch might be in the near future. I love tacos, soft or crunchy, not only because they taste good, but also because being basically beans and salad, it’s pretty healthy and easy to prepare. Once you’ve put the black beans in the slow cooker, all that remains to do is chop up the fillings when you’re ready for dinner. I decided to make this a DIY soft taco dinner, so all the fillings were put in individual bowls and we just helped ourselves. It does create more washing up that way, but it’s not too bad. 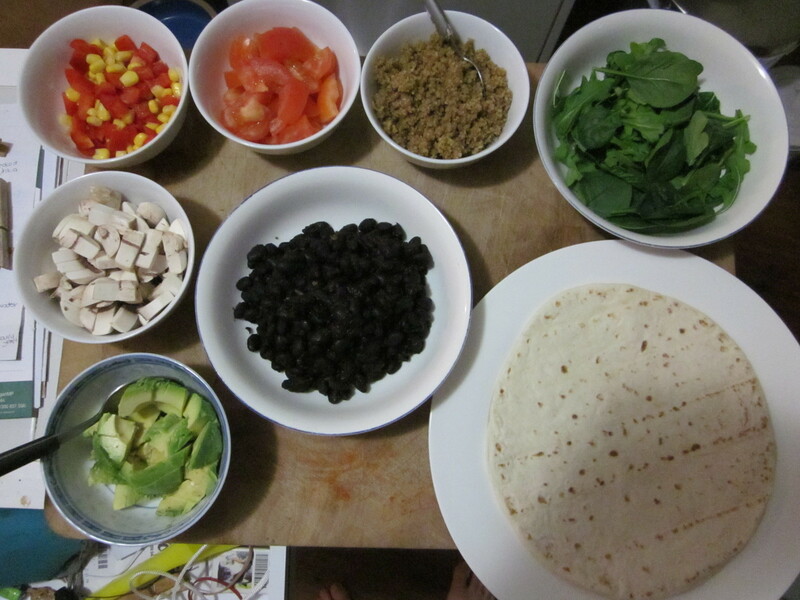 To go with the beans, we had baby spinach & rocket, chunks of avocado, red capsicum & corn kernels, chopped tomatoes, diced mushroom and taco nut meat (this is an Ani Phyo recipe – click the link to see it), all piled into a tortilla. Yum! If your slow cooker has a sear setting use that to cook the garlic and onion for a few minutes in a little olive oil first, or else use a pan. Next add the herbs and spices and stir through. Finally add the beans and stock, then pop on the lid and slow cook for 6 hours. Once they’re ready put some into a bowl and serve up with the rest of your fillings.